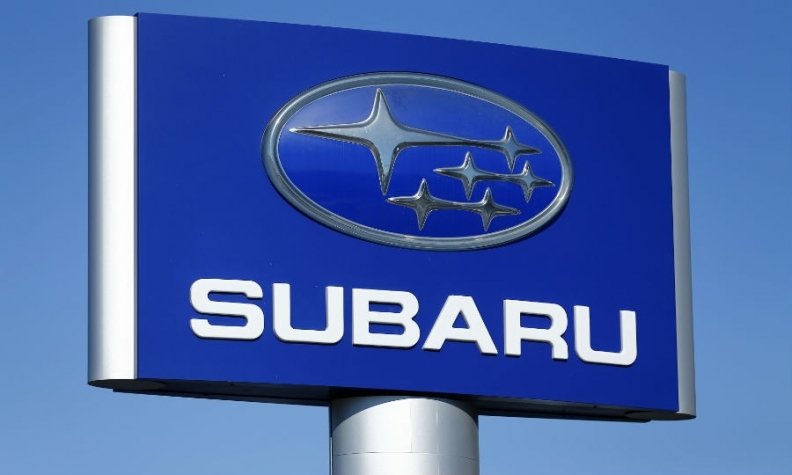 TOKYO — Fuji Heavy Industries, the maker of Subaru vehicles, reported a 29 percent drop in operating profit in the latest quarter as unfavorable foreign exchange rates, increased incentive spending and rising quality costs for recalling faulty Takata airbag inflators offset rising sales. Fuji Heavy's operating income fell to 106.99 billion yen ($1.06 billion) in the fiscal second quarter ended Sept. 30, the Japanese carmaker said in its earnings release today. Net income dropped 22 percent to 84.97 billion yen ($839.2 million). Revenue dipped 3.3 percent to 808.27 billion yen ($7.98 billion) in the July-September period, while global sales increased 8.0 percent to 266,800 vehicles. Announcing the results, President Yasuyuki Yoshinaga said earnings were weighed down by foreign exchange losses due to the yen’s rise against the dollar and other currencies. Increased outlays to replace defective Takata airbag inflators took another bite. Finally, higher incentives to move cars in the U.S., where overall market demand is flattening, delivered another headwind that slowed the company. To better focus Fuji Heavy’s limited resources on its core automotive business, Fuji Heavy said it would abandon its money-losing industrial products business, which manufactures general purpose engines for industrial and agriculture equipment as well as such finished goods as generators and pumps. It will be shut down Sept. 30, 2017. Fuji Heavy’s sliding profits in the current fiscal year break a string of stellar earnings. In the fiscal year ended March 31, the Japanese company chalked its third-straight year of record financial results on booming U.S. sales and big gains from favorable currency rates. But the yen has since reversed course, strengthening against other currencies. The dollar has also strengthened against key currencies, putting the squeeze on Fuji Heavy’s U.S. operations which host the carmaker’s only assembly plant outside Japan. Like other Japanese automakers, Fuji Heavy is being hammered by the Japanese yen’s appreciation. The more expensive yen erodes the profits Fuji Heavy and others make on vehicles sold overseas. For Subaru, the Japanese currency climbed 13 percent in value against the U.S. dollar by the end of the second quarter, compared with a year earlier. Swinging currencies lopped 52.5 billion yen ($515.4 million) off Fuji Heavy’s operating profit in the second quarter. And spiraling costs to recall vehicles with faulty Takata airbag inflators also dragged down quarterly operating profit. Fuji Heavy took a 15.3 billion yen ($151.1 million) charge to settle warranty claims, including Takata costs, in the quarter. North America, which accounts for 66 percent of Subaru’s global sales, saw regional operating profit decline, on the back of foreign exchange losses and higher incentives. Regional operating profit decreased 19 percent to 26.5 billion yen ($261.6 million). North American sales, however, remained robust, driven by a 14 percent increase in U.S. sales to 150,200 vehicles in the quarter. Rising incentive spending undercut earnings. Average outlays in the U.S. rose to around $1,200 per vehicle, up some $300 from the previous year, Yoshinaga said. He added that Subaru has the leeway to increase average incentive spending to as high as $1,400 to stay competitive in a tougher U.S. market. “While keeping the Subaru business model, we would like to increase sales, so we wouldn’t mind increasing incentives,” Yoshinaga said, adding that incentives may help whittle away the heavy leasing ratio for certain nameplates such as the Legacy. Subaru has slightly trimmed output of the Legacy to control inventories, he said. Sales in Europe slid 14 percent to 9,800 vehicles in the second quarter. Operating income in regions outside Japan and North America swung to a profit of 2.4 billion yen ($23.7 million), compared with an operating loss of 4.4 billion yen ($43.4 million) a year earlier. Under Subaru’s mid-term business plan, the company aims to boost global sales above 1.2 million units in the fiscal year ending March 31, from 957,900 vehicles sold in the fiscal year ended March 31. Subaru expects North American sales to exceed 800,000 by then. Citing higher quality-related costs and worsening exchange rates, Fuji Heavy lowered, for a second time, its forecast for the current fiscal year ending March 31, 2017. The company now expects full-year operating profit to slump 34 percent to 373.0 billion ($3.68 billion), from last year’s record 565.6 billion yen ($5.58 billion). In August, it cut the forecast to 400 billion yen ($3.95 billion) from an original of 420 billion yen ($4.15 billion). Net income, meanwhile, is seen declining 36 percent to 278.0 billion yen ($2.74 billion). In August, Fuji Heavy had cut its net income forecast to 285.0 billion yen ($2.81 billion) from an original outlook of 293 billion yen ($2.89 billion). Fuji Heavy lifted its global unit sales forecast to 1.06 million vehicles for the current fiscal year. That represents a 11 percent increase over the previous year and is up from the forecast offered in August for worldwide sales of 1.05 million vehicles.